Gloria’s homemade ice cream is a perfect treat on a warm summer day. Here, Gloria holds a cold bowl of her ice cream. The Amish Cook column is celebrating is 26th year this month and it was three years ago this week that Gloria Yoder picked up the pen for the first time. Since then we’ve seen her family grow and learned a lot about the New Order Amish and Amish life in general. I want to thank readers for welcoming her into your home each week and thank Gloria for letting us all into her life. As the editor and creator of The Amish Cook column I’m more than amazed that it is still going and it is because of you. If anyone would have told me when I was 18-years-old in 1991 that the column would still be chugging along in 2017, I would have thought they were nuts. For me, there have been a lot of changes since Gloria took over. At the time, I had just become a Dad, with our daughter Aster born in September 2013. And since then we have welcomed another, our beautiful 10-month old Beatrice Rose keeps me on my toes. It’s an exciting and happy time for this editor. Through July 31, there is an “anniversary special” on books, this will probably be the last time these are available: SUMMER BOOK ANNIVERSARY SPECIAL — The entire Amish Cook softcover library is now available to celebrate the column’s anniversary this summer. This is the last time these books will be offered, first-come, first served. The titles are: Original Amish Cook Cookbook, Williams Guide to Amish Country, The Best of The Amish Cook, Vol 1, The Best of The Amish Cook Vol 2,The Amish Recipe Project, The Amish Cook’s Everything But the Kitchen Sink Book, The Amish Cook Cookbook, and two Amish-themed fiction novellas: Rebecca at the Beach,Searching for Rebecca – eight books for $69 plus $3 shipping, Send to: Oasis Newsfeatures, PO BOX 157, Middletown, Ohio 45042. Allow two weeks for delivery. Gloria will return next week, but it was just important for me to reach out and thank readers personally for being the best readers a column could ask for. Enjoy these three recipes from Gloria’s home to yours! Mix “crumbs” mixture until crumbly. Put some crumbs in the bottom of each pie crust. Reserve the rest of the crumbs. Scald milk over medium heat. In a separate bowl, mix flour, sugar, salt, vanilla, egg yolks, and milk. Mix this together and pour into scalded milk. When cold add 3 cups of home whipped cream or whipped topping. Divide pudding into the baked pie crusts. Top with remaining crumbs and serve. And lastly, try this summer specialty. Flat Rock, Illinois is in the state’s “corn country” and fresh corn is a staple on Amish menus this time of year. Try it scalloped! 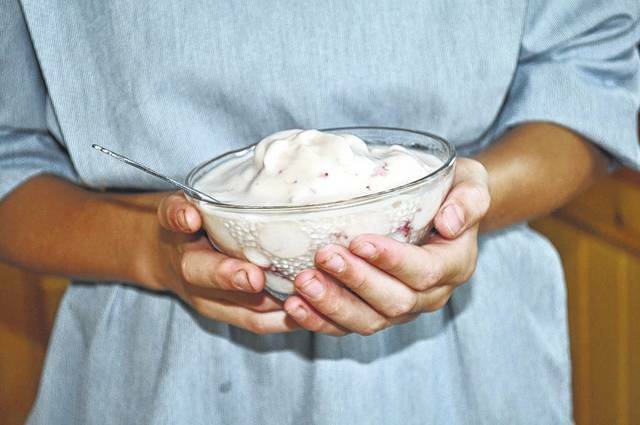 https://www.recordherald.com/wp-content/uploads/sites/27/2017/07/web1_ice.jpgGloria’s homemade ice cream is a perfect treat on a warm summer day. Here, Gloria holds a cold bowl of her ice cream.